I have always had a problem with 'real' sourdough bread. Not a taste problem. Actually, I really like the sour flavor and the chewy texture. Uh, uh. my problem with 'real' sourdough bread is with the word real. I mean, to make it authentic, supposedly, you have to capture wild yeast in your kitchen and then feed the sourdough for a few weeks until it's ready to use. And, frankly, who has patience? Or time. Who wants to start the process today to eat great bread next week or month? By then, will I still be in the mood? Probably not. So I am bringing you a compromise solution. The taste is almost exactly like 'real sourdough. And the process just takes an overnighter. The yeast is regular commercial dry yeast (instant dry or rapid rise). The difference is in the time, of course and the amounts used. I have added chopped walnuts to give it extra punch. 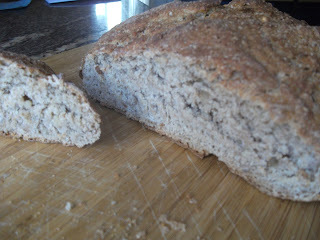 And also because walnuts in a slow baked bread are simply outrageously delicious. Take the time, you'll love it! 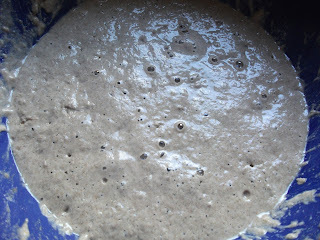 Mix the yeast in with the flour, then stir in the water to make a rather thick slurry (wetter than a paste). Cover and let stand, at room temperature, for a few hours, or overnight. I mixed mine at 9 pm, then let it stand. It's now 9 am the next day and I am continuing. Mix this into the starter, adding the water gradually until you get a rather sticky dough. Move the dough to a heavily floured surface and knead for a few minutes to make it smooth. You may have to add more AP flour as the whole wheat (or spelt) absorbs a lot of water. Towards the end of the knead, incorporate the walnuts into the dough until evenly distributed. Form into a ball, then place on a parchment paper on a baking tray to rise until almost doubled, about an hour or so. Slash the bread with a sharp, serrated knife or razor blade. Preheat the oven to 375 F (190 C) about 20 minutes before baking time. Spray the bread with water before placing in the oven. You should bake with steam by placing a tray with boiling water in it on the floor of the oven just before baking. Bake for 35-45 minutes until wonderfully deep brown and crusty. 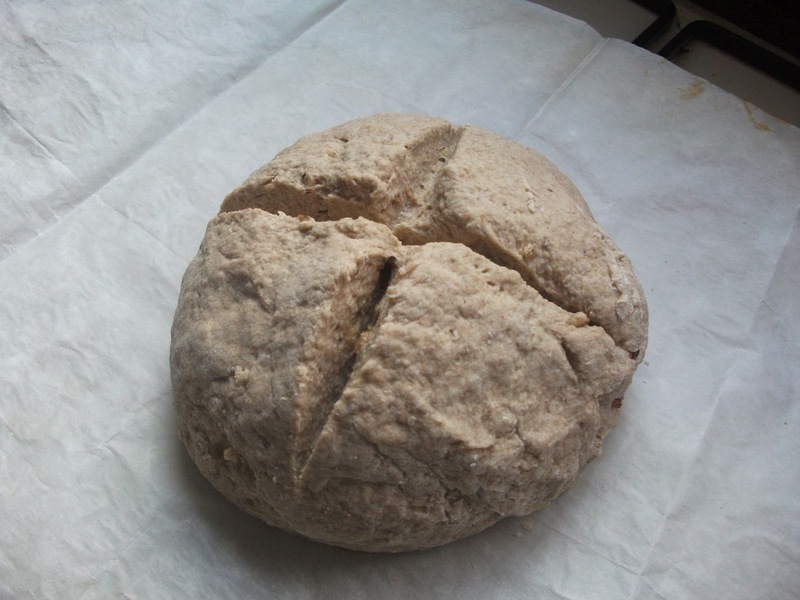 You can make the bread even crustier, by baking on a baking stone if you have one, or at least removing it from the tray to the stone for the last few minutes. BTW, the house will smell heavenly and I bet you can't wait for it to cool completely (on a rack) before slicing. This looks wonderful,tasty and so easy to make. I am definitely baking it and pinning it to Pinterest. Thanks. It is wonderful and keeps for a few days before drying out (sigh!). It is definitely a keeper. Thanks for this recipe. I'll try it. Anything that produces that wonderful sourdough flavour without all the work I'm for. I did once for a while cajole a sourdough starter into existence and use it but it's too much fuss and bother for me. OK. So first things first. I am also from Cape Breton Island, Nova Scotia. I grew up in Sydney and still have an elderly aunt and uncle there. My father worked at the Sydney Steel Company, and my mother was at Moraff's on Victoria Road. Where are you on the Island? As for rye kernels, since NZ really is very far, try finding a farmer who plants rye. Take a handful of seed in a jar with cheesecloth over the top (with a string or rubber band). Pour about a cup of water through the cloth into the jar, make sure the seeds are well soaked then pour out the water through the cloth. Place the jar in a dark, cool place (not hard to find on Cape Breton). Do this every day for about three or four days until the seeds start to sprout. There you have it sprouted rye kernels! BTW, you can do this with any grain. 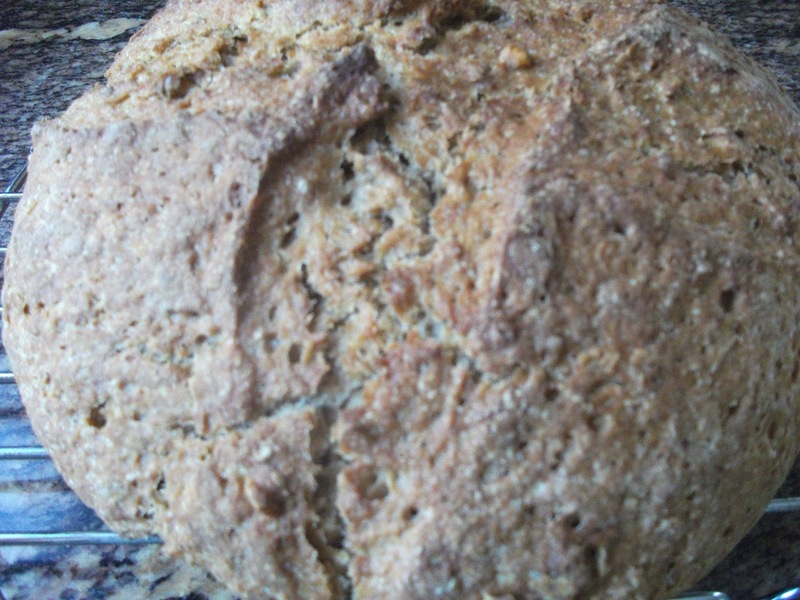 I have seen recipes calling for sprouted wheat or barley, and it's the same technique. Thanks, fellow Cape Bretoner. I live between Port Hood and Judique about five miles off highway 19. I'll try to find some rye kernels in the store. Not many, if any, farmers planting rye in Nova Scotia. By the way, David, an easier and more effective way to steam your bread is to use a large disposable aluminium roasting pan (I don't dispose of it) over the baking stone and the bread. I spray the inside of the pan, put the bread on the stone, put the pan over it and bake it for about 12 to 15 minutes. Then take the roasting pan off and finish it. At first I tried to fan a roasting pan that exactly fit the stone but that's not necessary. Doesn't matter if it hangs over on two sides as long as two sides sit on the stone. Works beautifully for steaming the dough. I use a disposable pan that I place under the dough, but for the same purpose. When I want to vent the steam, I turn the oven on to 'turbo' function for a minute or so, and that removes the steam from the oven without opening it. BTW, you can use the sprouting technique with any grain so you could sprout wheat or barley for instance. Also, you can take rolled oats, run them through a food processor for a minute or so, and get oat flour. It works great and makes wonderfully tasty bread. You Should Definitely Check Out! I have been baking for a long time. Bread mostly, but not only. The whole process from water and yeast in a bowl becoming hot fragrant bread is one of life's great pleasures and mysteries. Come share this magic with me along with stories of childhood memories and bready adventures from everywhere! 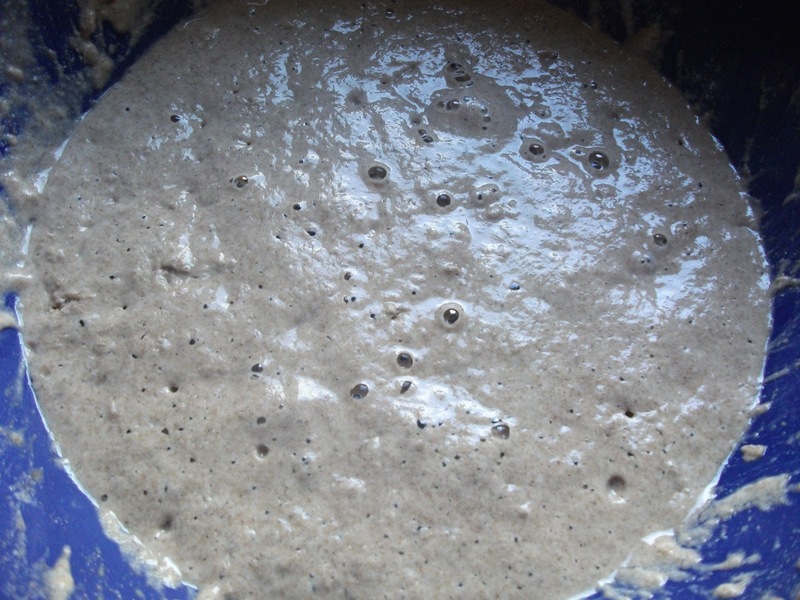 Submit Your Own Bread Recipes to Yeast Spotting here!